Every music scene has its survivors, those few bands that manage to keep on going, very successfully and despite all odds, long after its peers gave up the ghost. Seattle has Pearl Jam, Halifax has Sloan, the British Invasion has the Rolling Stones, San Francisco had the Dead, Athens had REM, and “Madchester” has the Charlatans. Sometime around 1989, the indie rock scene in and around Manchester completely blew up. It took the UK by storm and made a fair dent in the States as well (it was pretty much all I listened to at the time). Generally, the scene consisted of artsy bands that blended 60’s psychedelic textures with dance beats and, fuelled by ecstasy and baggy clothing, pretty much gave rise to rave culture and Britpop at the same time. Madchester’s “big four” were The Stone Roses, Happy Mondays, Inspiral Carpets, and the Charlatans. Each band had its own sound and vibe, but they were all influenced by each other and clearly made up a unique local core of musicians. The Stone Roses were destined to be bigger than the Beatles (and they possibly could have been) but then they flamed out before they could pull it off, and were done by ‘96. Happy Mondays were long gone by that point, and the Inspirals were quietly limping away. All of those bands would eventually reunite, to some degree, but it’s never quite the same. And we’re still waiting for that third Stone Roses album anyway. The Charlatans, however, never quit plugging away. And I, for one, am very thankful for that. Despite many setbacks and obstacles over the decades, they persevered, touring and releasing album after album. Some of those albums were really huge (Tellin’ Stories, Simpatico, Us And Us Only), some were hidden gems (Up At The Lake, Who We Touch), some were instant classics (Some Friendly, the self-titled 4th album) and some were ones that took a little while to absorb (Up To Our Hips, You Cross My Path). But every last one of those albums is outstanding (as are the ones I did not mention). The Charlatans are one of those bands whose every release is unique in style and production, but they always sound like the Charlatans. Their songwriting is constantly maturing and evolving, their musicianship and skills as arrangers continues to grow, Tim Burgess is forever in perfect voice, and they are never afraid to try something new. That is the mark of a great band, the reason they have endured, and the reason why I have completely adored them for almost 28 years. 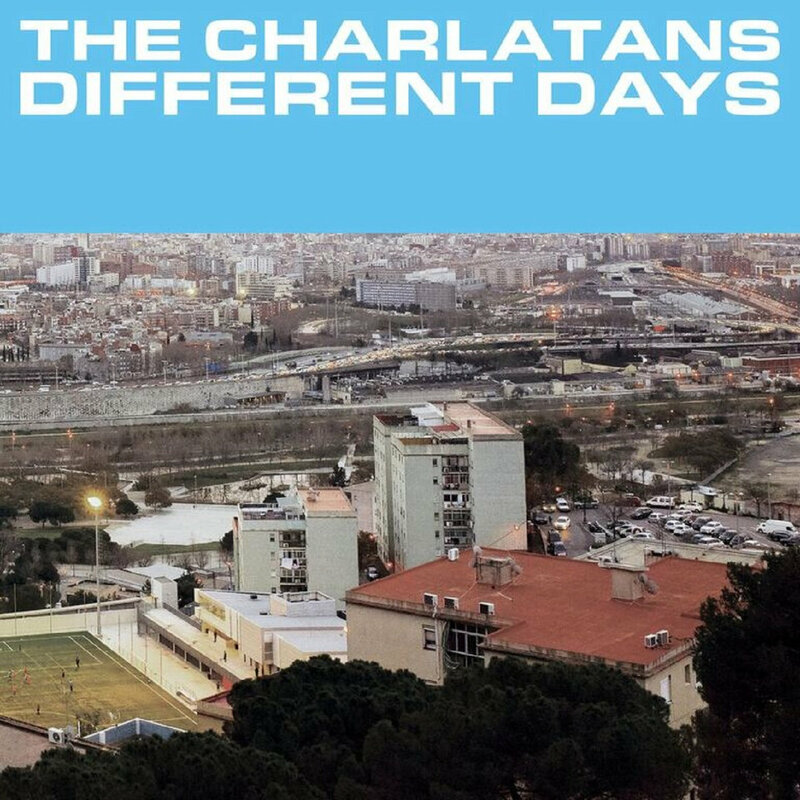 Different Days is the Charlatans’ thirteenth studio album and it finds the band embracing a very modern production approach. It’s clear they have been listening to bands such as Syd Arthur and Mystery Jets and those influences really shine through on songs such as the epic opener, “Hey Sunrise”, the odd meters in “Solutions”, and the exquisite grooves of the title track, one of the best songs I have ever heard from this band. It’s not until the fourth track, “Plastic Machinery” that you really get a feel for that “classic” Charlatans sound, and it is clear why this was their choice for the leadoff single. This is dark, it is immediate, it has something to say. When all is said and done with this band, hopefully many years from now, this will certainly be one of their stand-out singles. There is a little bit of spoken word on this album, and I’m honestly not sure what I think about that. Scottish crime novelist Ian Rankin tells a story, linking the title track and “Plastic Machinery”, and that’s kinda cool. The great Kurt Wagner (from Lambchop) makes a cameo, speaking over “The Forgotten One”, an otherwise ambient little piece which serves as an intro to “Not Forgotten”, which is another song that is clearly in the band’s wheelhouse, and possibly one that is destined to be the next single. A lot of this album reminds me of their second album, 1992’s Between 10th & 11th, and the various singles and EPs that came out around that time. That influence is apparent in this song and I also hear it in “There Will Be Chances”, which reminds me of the entire Over Rising EP, all wrapped up into one killer song. “Over Again” features a very danceable groove and finds the band exploring, sonically, in some slightly unfamiliar territory. One of their more synth-heavy songs, this features a dark & dirty verse and a chorus that would be fun to sing along with. That soon moves into the particularly odd “The Same House”, a song that is going to take some time to sink in – more an experiment than a song and the only thing keeping this album from being perfect. But soon the driving, lifting “Let’s Go Together” takes over and brings the album back to some semblance of reality. A song that could be a single, it fades into the mellow instrumental, “The Setting Sun”, which sets us up for the laid-back vibe of the “Spinning Out”, the band’s collaboration with Johnny Marr, from the Smiths. One of the things that makes this album such a success is the way they make what is very clearly a Charlatans record, one that is every bit as good (or better) than any other Charlatans record, and they make it sound as fresh as any other record coming out at this point in time. How many bands create music this relevant, so far into their career? Not a whole lot, I’ll tell ya that. 28 years in, this band should be phoning in their albums, not creating their most inspired work. But nope, they take what they know and they make it sound new, and even throw in a twist or two, and they do it all without sacrificing one lick of their artistic integrity. Which is why I love The Charlatans, and why you should too.